Kramer Guitars made a triumphant return to the NAMM show in Anaheim in January with classics like the Baretta Special and the Kramer ’84 along with Jersey Star, the Night Swan, the Assault Plus, and the Focus VT-211 in five new color finishes plus American made Seymour Duncan™ pickups, Floyd Rose™ hardware, and all the custom design features that made Kramer a worldwide favorite of the very best shredders. 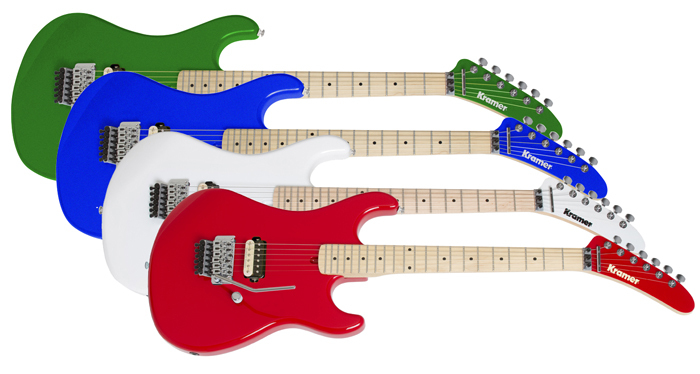 Be sure to check out the full color catalog and stay on KramerGuitars.com for more details. 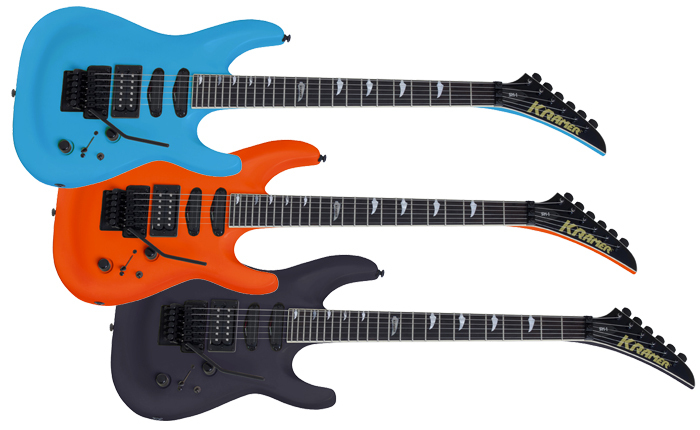 The Kramer ‘84 is a rock classic made new again for the 21st century. Featuring a light Alder body, Hard Maple neck, Seymour Duncan™ JB Zebra Coil Humbucker with a Push/Pull Series Parallel Tap plus a Floyd Rose™ 1000 Bridge and Tailpiece combo with R2 Lock Nut. Available in Alpine White, Radiant Red, Blue Metallic, Matte White, and Green Soda. The Kramer Assault Plus merges the classic look of a Les Paul with a Flame Maple Veneer top with Kramer power! Featuring Seymour Duncan™ JB and JNZebra Coil Humbuckers, a Floyd Rose™ 1000 Bridge/Tailpiece combo with R2 Lock Nut, and a hand-set Mahogany neck. Available in Trans Purple and Bengal Burst. The Kramer Baretta Vintage honors one of the most influential guitars in music history that set the standard for modern metal. Featuring a Maple body, Hard Maple neck, a legendary Seymour DuncanTM ‘JB’ Humbucker with Push-Pull Coil-Splitting, a Floyd Rose™ 1000 Series Bridge/Tailpiece and R2 Lock Nut, and a fast K-Speed “C” Slim Taper neck. Available in Ruby Red and Pewter Gray. The Kramer Focus VT-211S is an ideal way to start your Kramer story! Featuring two powerful Kramer Alnico-V SC-1 single coil pickups, a Kramer Alnico V humbucker, 5-way pickup selector switch, and classic Kramer bridge and tremolo system. Available in Ruby Red, Pewter Gray, Teal, Purple, and Natural Satin Finish. The legendary Kramer Nightswan is back featuring two Seymour Duncan™ ‘JB’ humbuckers, a Floyd Rose™ 1000 Series Bridge and Tailpiece, Floyd Rose™ R2 Lock Nut, Ebony fingerboard and ebony color finish with blue polka dots. 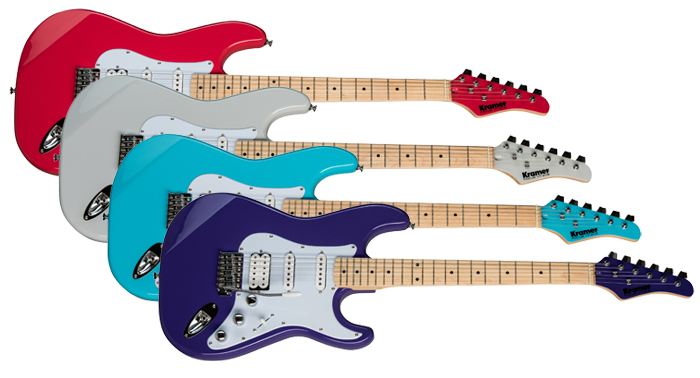 The Kramer SM-1 has incredible sustain thanks to its thru-neck design. Featuring a double cutaway Mahogany body, Ebony fingerboard, Seymour Duncan™ Cool Rail and ‘JB’ humbucker pickups, a Floyd Rose™ 1000 Series Bridge/Tailpiece and R2 Lock Nut, and an Ebony fingerboard. Available in Candy Blue, Crush, and Maximum Steel. The 80’s classic Jersey Star returns has the same iconic Mother-of-Pearl Jersey Star logo, gold hardware, Seymour Duncan™ JN and JB humbuckers with coil-splitting, and a Floyd Rose™ 1000 Series Bridge and R2 Lock Nut. 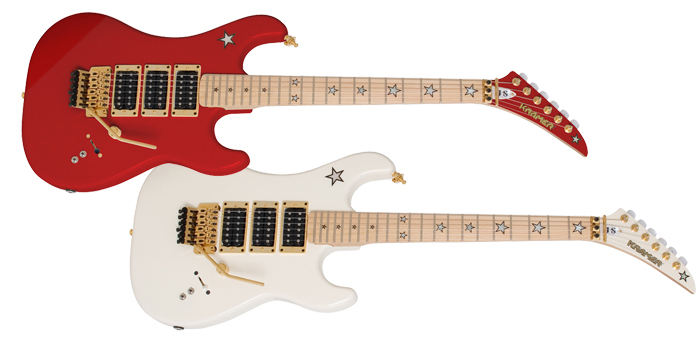 Available in Alpine White and Candy Apple Red finishes. The Kramer Baretta Special is a great way to discover one of the most influential guitars in rock history at a priceanyone can afford! Featuring a powerful Alnico-V “zebra-coil” humbucker with a singlevolume control, tone-rich Maple body and neck, and a classic Kramer bridge and tremolosystem. Available in Candy Blue and Ruby Red. 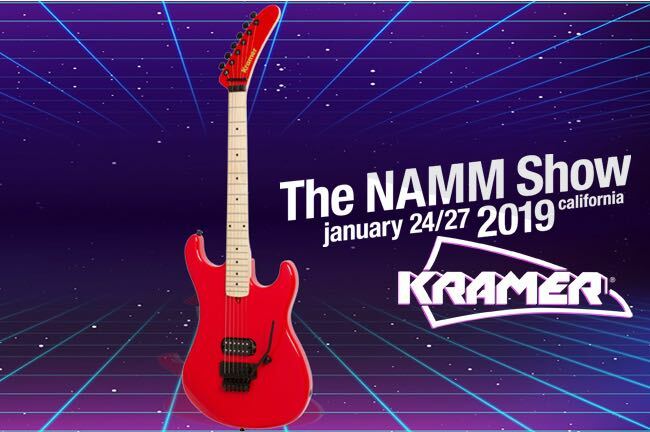 Stay tuned to KramerGuitars.com for news, artist interviews, highlights from NAMM, and much more and look for your favorite Kramer models in stores in May, 2019. Download the 2019 catalog here!